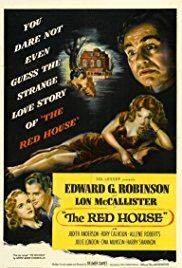 One of the most interesting screenings at the recent Arthur Lyons Film Noir Festival took place on Saturday, May 12th: The world premiere of the UCLA restoration of THE RED HOUSE (1947). The restoration was funded by Martin Scorsese's Film Foundation. My understanding is it will be presented at the 2019 UCLA Festival of Preservation at UCLA's Billy Wilder Theater. THE RED HOUSE had fallen into public domain and thus is all over YouTube as well as available in myriad DVD copies, but I think I can state with confidence that none of those prints look anywhere near as good as the beautiful print screened at the Palm Springs Cultural Center. It was a memorable film, one of the highlights of this year's festival. THE RED HOUSE was written and directed by Delmer Daves, based on a novel by George Agnew Chamberlain. The movie might be termed "Gothic noir," or perhaps "Gothic farmhouse noir." It mixes bright, sunny scenes with beautiful young people with a dark, overbearing creepiness and warnings not to ever go into the nearby woods... It's quite an effectively done film. 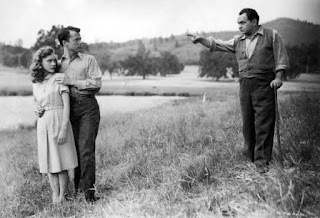 Orphaned Meg (Allene Roberts) has been lovingly raised by Pete (Edward G. Robinson), a farmer, and his sister Ellen (Judith Anderson). Meg has some suppressed memories, however, which begin to bubble back to the surface after Pete hires one of her schoolmates, Nath (Lon McCallister) to help with the farm chores. Nath enrages Pete by taking a shortcut home through the dark woods; the experience doesn't go so well and Nath must turn back to the farmhouse to spend the night. Meg, meanwhile, starts having feelings that there's something about the woods she should remember. 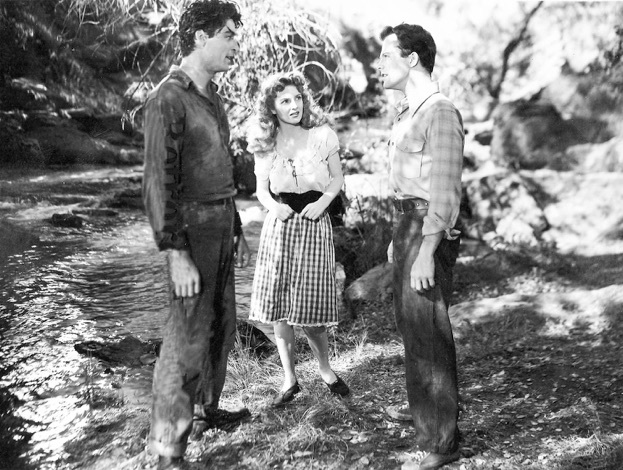 The only person allowed in the woods is Teller (Rory Calhoun), hired by Pete to keep others away. Bad boy Teller attracts the attention of Nath's girlfriend Tibby (Julie London); Nath, meanwhile, slowly becomes more interested in Meg, who is also falling for him. Nath, Meg, and Tibby decide to go exploring in the woods, looking for a mysterious house they believe is there...which eventually proves to be an important part of Meg's past. I'll stop there so as to preserve the mystery, but suffice it to say this is a very well-done and engrossing 100 minutes with terrific atmosphere. 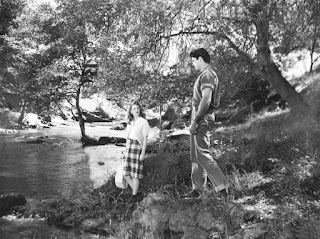 It was beautifully filmed (by Bert Glennon) in Sonora and Columbia, California; the striking locations, such as the river where the teenagers go swimming, give the film a fresh, unique look. McCallister (HOME IN INDIANA) and Roberts (THE SIGN OF THE RAM, UNION STATION) are appealing as a pair of goodhearted young people, and the young Calhoun and London are simply stunning. As an EMERGENCY! fan dating from childhood, it was great fun for me to see London in such a significant role, filmed when she was about 20. The Robinson and Anderson parts aren't anything out of the norm for either of them, but they do their usual fine jobs and their performances are key to sustaining the film's mood. The cast also includes Ona Munson, recently reviewed here in THE HOT HEIRESS (1931), as McCallister's mother, Harry Shannon as the doctor, and Arthur Space as the sheriff. The score was by Miklos Rozsa. It is to be hoped that eventually this beautiful print will make its way to DVD and Blu-ray, but in the meantime watch for it to show up in revival houses over the next couple of years. 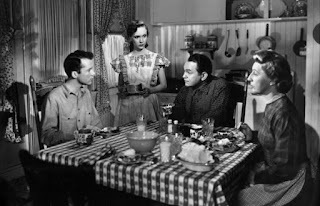 Coming soon: An overview of the final day of the festival and a review of UNDER THE GUN (1951), starring Richard Conte and Audrey Totter. Laura, a good review that didn't give away everything about this very memorable movie. THE RED HOUSE is a favorite of mine. I remember reading a tid bit about the movie in the 1970's, but I didn't get a chance to see it until the 1980's, when I caught it on cable TV. I taped it on an old Beta recorder, of which I later transferred to VHS. 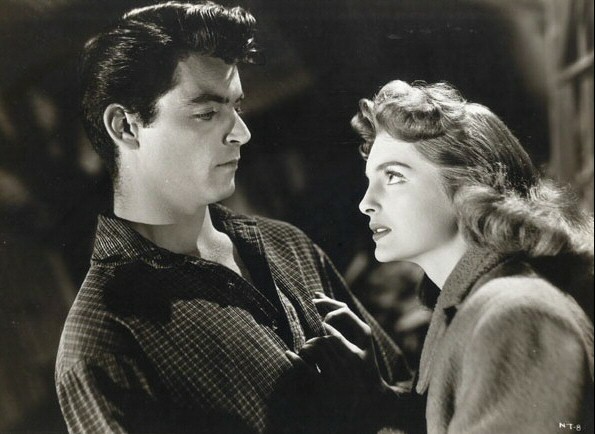 As we know, not all noir films take place in the dark alley ways of the city. So, welcome to the hinterlands of "Rural Noir", or "Country Noir." This movie brings back memories of some of my kith and kin. I haven't read the source novel, which was first serialized in the SATURDAY EVENING POST in 1945, but I would like to in the future. I highly recommend THE RED HOUSE to everyone. I've heard so much about this film, but have never seen it. Maybe it will make its way to the 2019 TCMFF! There's certainly an built-in audience for this film. Thank you, Walter! I'm glad to have you add your recommendation to this fine film. If only everyone could see this "rural noir" in a great-looking print! Stephen, TCMFF has shown UCLA restorations in the past, it seems like this would be a great candidate to be shown there next year. Let's cross our fingers! I think so many people would find it of interest, and what a great chance to see it looking the way it should! !